I can’t show you the world like Aladdin, but I can show you some great theme park ads. Now, you might be thinking, “It’s the holiday season. Going to an amusement park is the last thing on people’s minds.” While that may be true, you have the power to change that. It’s called Facebook advertising. You can excite your audience about your theme park all year round by implementing your creativity through the brilliance of the Facebook platform. 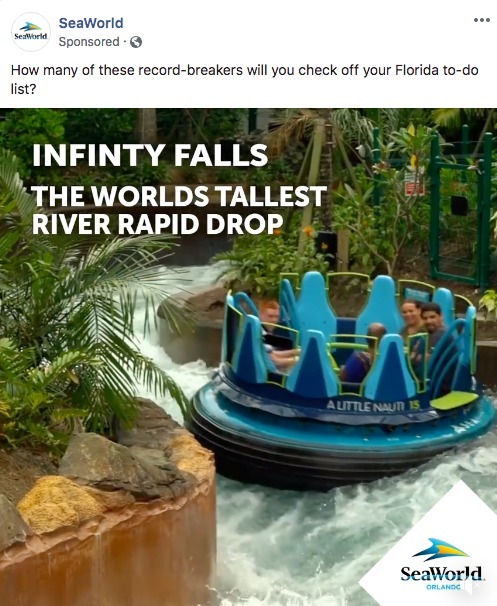 If you’re not sure how, or if your current Facebook campaign isn’t working for you, take a look at some of these ads by major theme parks to see how it’s done. In addition to getting people excited about their theme parks, these ads serve as great examples of value proposition, emotion, high-quality creatives, and mobile optimization. Disneyland taps into the holiday spirit to keep people thinking about the theme park even in the cold winter months. With the simple post text “Something merry has begun,” we are lured into watching the 15-second Facebook video to learn more. Then, regardless of where you live, you can almost feel the icy chill when you see the bundled-up family atop a mountain peak in a blizzard. Within the first two seconds, we know exactly what the ad is for through the close up of a snowflake with the classic Disney Mickey Mouse head. The snowflake then flies like Disney’s magic sparkles. We follow the Mickey snowflake to a young child, who looks up as the snowflake spirals around the Disney castle. 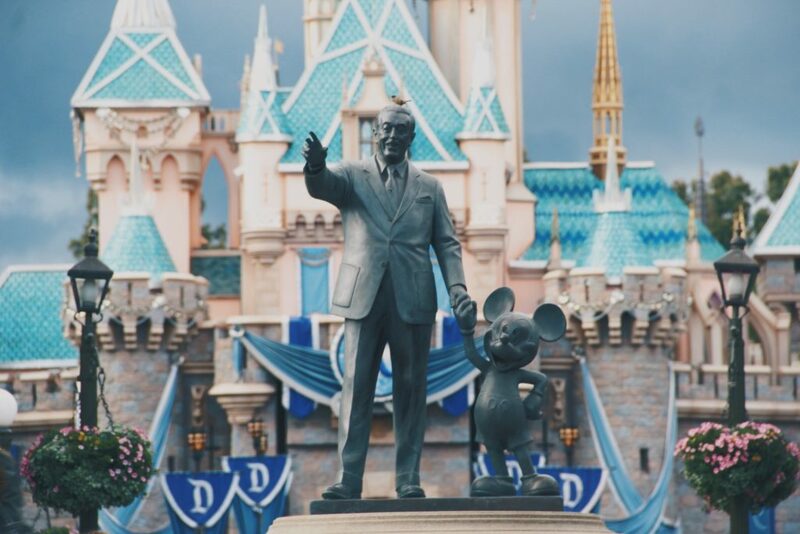 At this point, a white text overlay appears, inviting us to either visit Disneyland.com or call our travel agent to book a special holiday trip between November 9 and January 6. 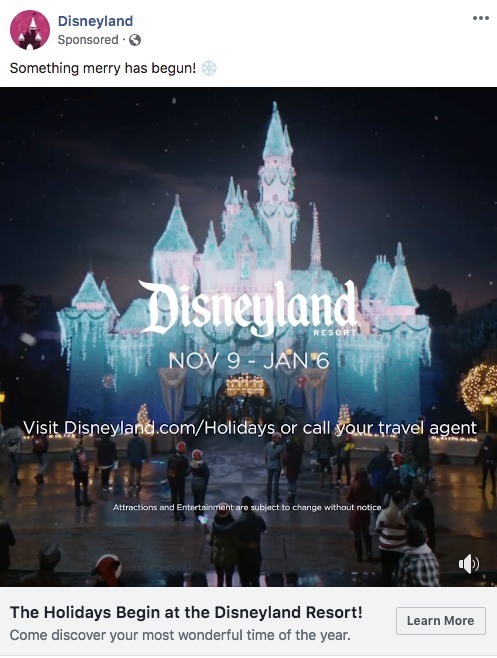 Below the video, we see the headline that reads “The Holidays Begin at the Disneyland Resort.” It is supplemented by the text “Come discover your most wonderful time of the year.” Both lines make the ad relevant to the holiday season when most people wouldn’t even think to go to an amusement park. This Facebook ad effectively triggers our childlike awe, imagination, and sense of adventure, using mountains, sparkles, Mickey Mouse, and the Disney castle. Additionally, the high-quality video and CGI makes it captivating, getting us to watch the video from beginning to end. This Facebook ad is effective because the gif is high-quality. If it were pixelated, we would subconsciously associate it with a poor quality experience at the theme park. Since the image is nice and sharp, however, it is more appealing and it is linked to positive experiences. 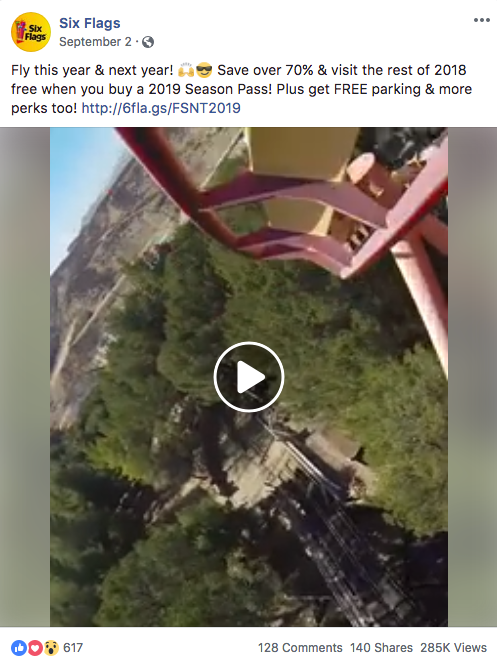 This Facebook video by Six Flags makes a hat trick of value propositions. First, the post text promises 70 percent in savings when you buy a 2019 season pass. Second, it says you can visit anytime for the rest of 2018 for free. Third, Six Flags tosses in the word free a second time in reference to parking. Additionally, the video evokes thrill and a rush of adrenaline by giving us a test ride on a roller coaster from start to finish. It affirms the type of experiences we can expect when we go to Six Flags. We actually have the first-hand proof. Finally, this ad is effective because it is optimized for mobile screens. The video is in square format, not horizontal, so we don’t have to rotate our phones to view the video in full screen, making it more convenient to watch. We can easily experience the thrill of the roller coaster from the palm of our hand. Knott’s Berry Farm plays itself up as a winter wonderland in this video ad. The sleigh-bell music combined with Christmas lights, cookie decorating, snowfall, holiday-themed performances, and Christmas trees gives us that warm, fuzzy holiday feeling. With shots of children and their families throughout, we also feel nostalgic. The video evokes all the feelings we typically have during the holiday season. 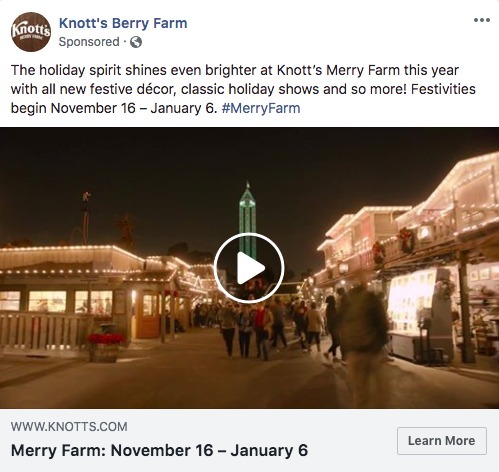 The post text accurately matches what we see in the video, adding a play on words, “Merry Farm,” to make a visit to Knott’s relevant this time of year. The ad also awakens the thrill-seeker in us by showing each ride and attraction in action. We see people smiling and enjoying each record-breaker, with the SeaWorld logo at the bottom corner throughout, so we naturally connect a fun experience with the brand. Legoland’s primary strategy with this Cyber Monday ad is value proposition. 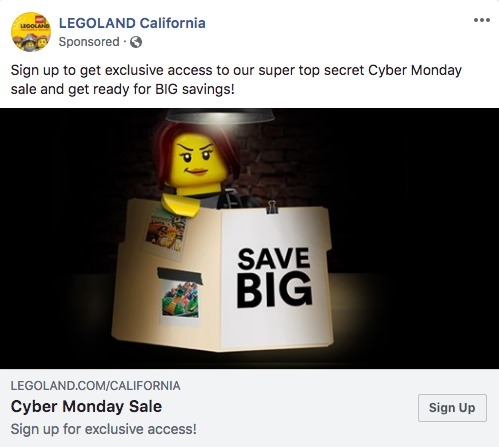 The post text promises exclusive access to its “super top secret Cyber Monday sale.” It also elicits curiosity and creates perceived mystery with the static image of a Lego character in an investigation. Additionally, the ad promises “BIG savings,” another value proposition, to direct our attention to the “Sign Up” call to action. People go to theme parks for thrill, fun, and good memories. Show them how your theme park will deliver each of these experiences by giving them a small taste in your Facebook ad. 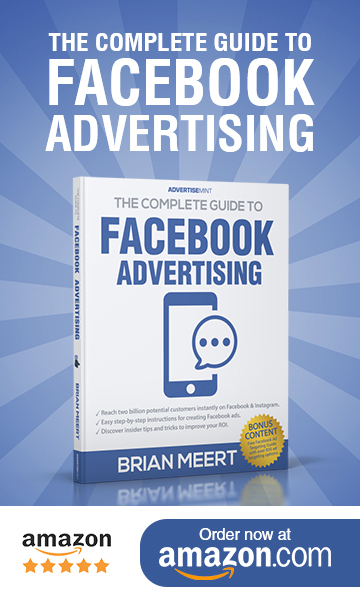 You will have to get extra creative to keep them interested at any time of the year by establishing relevance, as each of the ads in this article do. 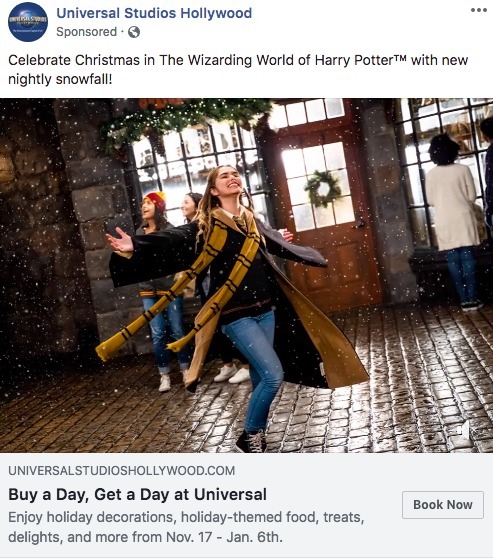 With these ad examples as your guide, you can be the next wizard of Facebook advertising for theme parks.